Ninja Assassin Fixed Blade Fantasy Knife With Ball & Chain | BUDK.com - Knives & Swords At The Lowest Prices! 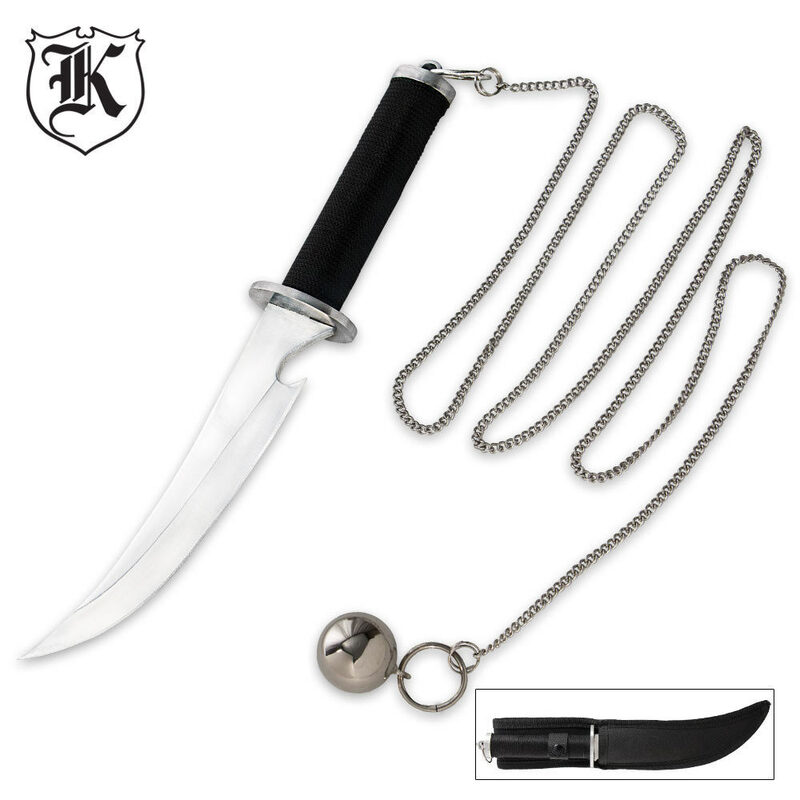 This inspired Ninja Assassin replica knife features a blade of 440 stainless steel with a sharp edge and piercing point. The shape of the blade is much like that of a full-sized saber, only on a smaller scale. 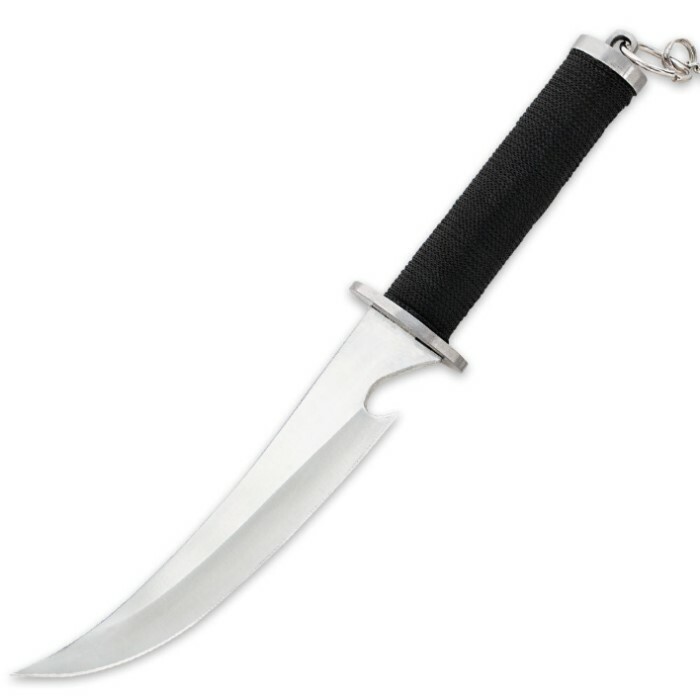 The handle incorprates a ball and chain, and it comes with a nylon sheath. If customizing I recommend doing and ito wrap on the handle to make it look like the one on the movie you'll need about 5 feet of ito wrap sold on sword n armory online. I also forgot to mention the ball it has some weight and can do a number if you hit yourself or someone swinging it. Thanks Budk, you guys are the best. I'm a big fan of this movie and really wanted this knife. I was very skeptical because most replicas are not functional. To my surprise things knife is awesome, very sharp and easy to handle. While the chain is very little and brittle, swinging this thing around isnt a good idea. Instead I went with a 4' 2mm chain which makes it more functional for swinging. I plan to added a more longer length of chain in the future or if you choose you can take the chain off its a really good knife without. Oh ive had this atleast 2 and a half years and never had any issue with rusting. I recommend to any fans or anyone interested in a modern shoge. The real products are the ball and the blade. The chain is total crap. The blade is a very nice blade though the nylon wrap is a little slick but nothing parachord can't fix. The rings are a disgrace but who doesn't have some key rings laying around? The ball (when attached to a real chain) can do some real damage If used correctly. In my years as a student of ninjutsu I have yet to find a chain weapon quite this nice. Though it certainly can be improved apon construction wise, it's still a very capable weapon in the proper hands. My third purchase from True Swords and once again they come through with a great item. They never cease to amaze me. Other than the chain being really thin and a lot shorter everything else was phenomenal. The blade is constructed great and it did come pretty sharp(at a good angle it can slice through paper and cardboard like a super sharp razor blade.) All in all great item and I will be purchasing more from them. The blade is fine, ye the chain is brittle.